Thunder Bolt or Lightning strike is a sensation , a human perceives when confronted by an extremely beautiful object, such as BOLT. Killer Looks ? If looks could kill ? No ways . BOLT has Blessed looks. Love at first sight is possible ... absolutely ... totally ... devastatingly ... possible with BOLT .The basic silhouette is so strikingly stunning that it's impossible to not to love the BOLT. 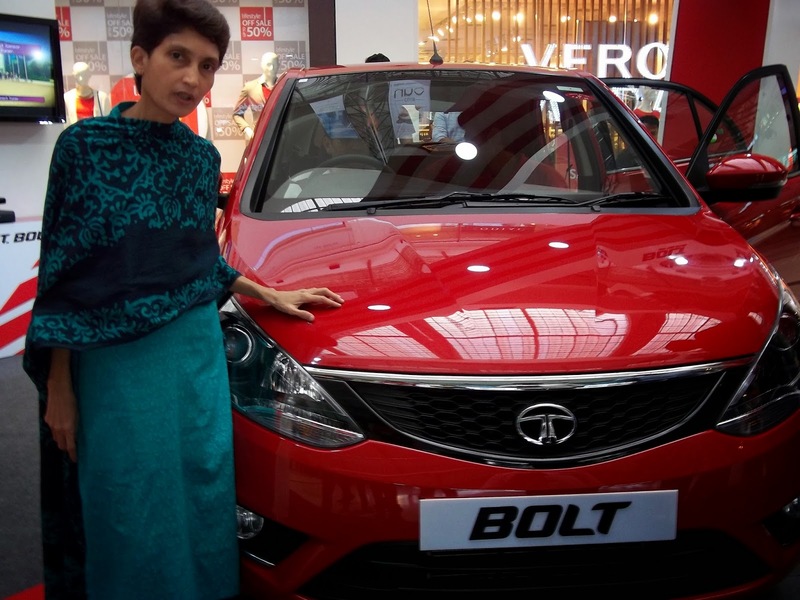 The superlatives, adjectives are inadequate to describe the ritzy, high-tech, ultra-modern, turbo-powered, exclusive, uber cool, futuristic persona of the BOLT from Tata Motors. 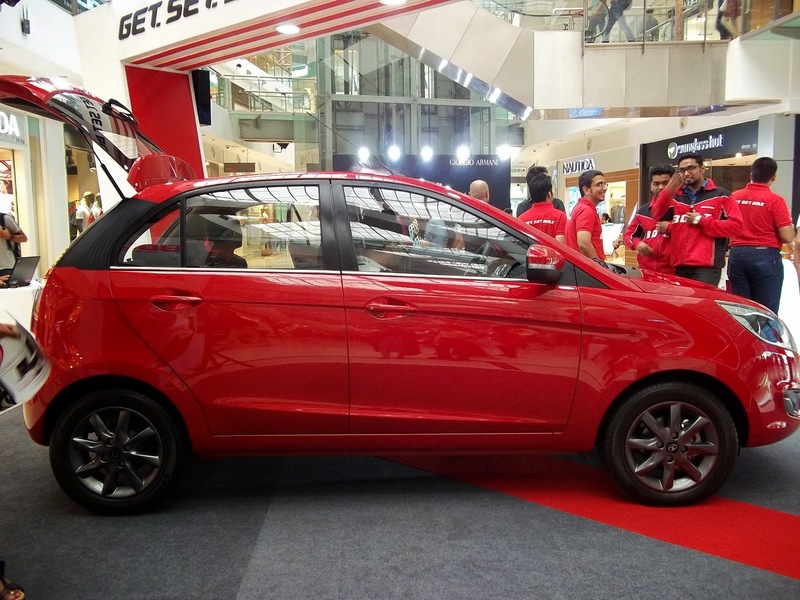 My nephew Aamen went CLICK-CLICK-CLICK , when he spotted this RED Beauty , in it's full glory at the Oberoi Mall. is available in both the petrol and diesel form. The petrol variant features new turbocharged unit. The 1.2 litre Revotron motor produces 90 PS of max power and max torque of 140Nm is offered from a lower 1500 rpm up to 4000 rpm. Driving ability is impressive while turbo lag is minimal and the feel is similar to compact sedan. The 5-speed transmission offers positive and smooth shifts. The fuel efficiency is better. Thunderous applause 2: (Infotainment) BOLT has the touchscreen infotainment system developed in partnership with Harman . It consists Bluetooth connectivity with voice integration, SMS read outs, touch operated AC controls and a picture viewer etc. The stereo has eight speakers with good audio output and clarity. Bolt also has video playback and navigation . Video files stored on the SD card can be played anytime. Navigation function uses the Android phone's built-in GPS and a MapMyIndia app with four years of free service as well as offline maps. Thunderous applause 3: (Safety) BOLT XT variant can handle sudden braking or tight corners, with its latest 9th generation ABS( Anti-lock Braking System ) by Bosch with Corner Stability Control ( CSC ). This improves braking efficiency. Dual airbags are also offered for enhanced safety. The improved chassis and softer suspension maintain a better balance between ride and ground clearance. The suspension absorbs potholes and rough roads comfortably resulting in smooth ride. Thunderous applause 4: (Space) BOLT is quite tall due to raised height. Cabin is spacious. Foot room, Knee room and headroom are big. Tall passengers can sit comfortably in the rear, which has a firm seat and fine headroom. Shoulder room is also on the higher side. Three adults can sit quite luxuriously in the rugby back seats. There's a handy cup holder in the center console. It has 210 liters boot space. Thunderous applause 5: (Sports , Eco , City Modes) BOLT's Multi Drive function allows us to choose between three driving modes. There is a considerable enhancement in the performance and comfort attached to all 3 modes i.e. Sports for a burst of power , Eco for unmatched mileage and City for the perfect balance. These modes offer excellent, relaxed and comfy ride-quality in different situations. My lucky-charm , my BOLT-band. 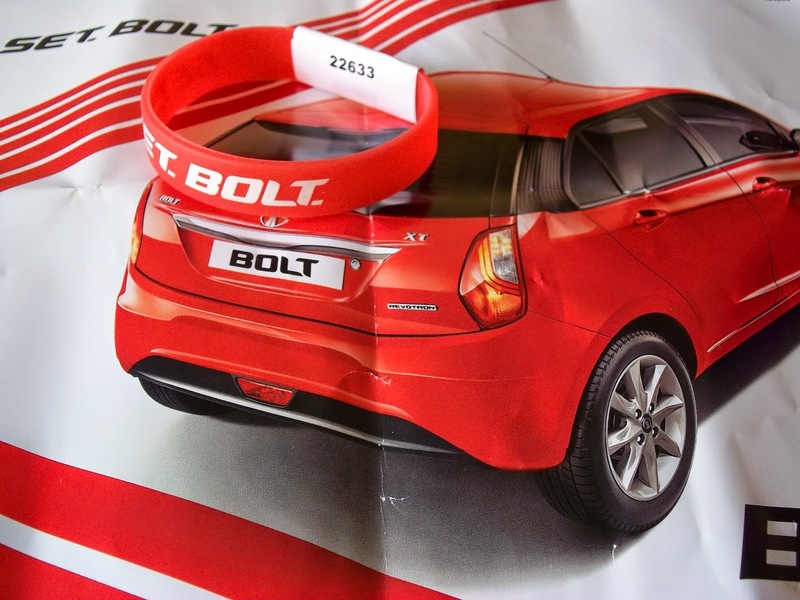 And yes I have marked out the parking space for the new BOLT that I am going to win. TATA has a winner in their hands. The new Bolt and Zest are seriously good cars. If only they can change the perception that we have w.r.t TATA service which is still extremely bad in most areas. Until this is changed, they can never compete with the likes of Maruthi and Hyundai.